Who doesn’t absolutely love to grill in the summertime? One of the easiest and healthiest recipes to make are these Grilled Shrimp Skewers with a Creamy Chili Sauce! It takes no time at all and you can eat the shrimp in a lot of different ways. 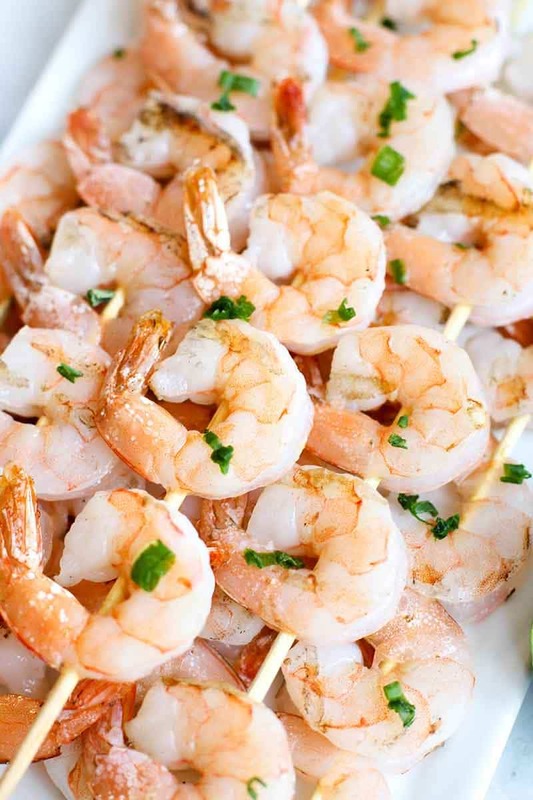 You can leave them on the skewers and serve them as an appetizer, or add the shrimp to your meal as the main protein. Try using the shrimp in a light and refreshing salad or even in a wrap to take to work. If you are feeling really adventurous, use the shrimp and lots of fresh veggies in a spring roll. The creamy chili sauce makes a great dipping sauce! Spring roll wraps are usually on the shelf in the International section of the grocery store. You can pick up sambal oelek while you’re there if you don’t have it already! If you don’t know what sambal oelek is, it’s this great Asian chili paste that has different types of chilies, garlic, and ginger with all sorts of layers of flavor. Think Sriracha, but more but with more depth in terms of flavor. I’m a sucker for any sort of spicy dipping sauce for shrimp, so I wanted to try and create something a little different to the standard cocktail sauce. Sambal oelek is my current obsession, so I wanted to incorporate that into the dip. Sweet chili sauce would have been the obvious way to go, but I didn’t want to include all of the sugar that is typically used in it. Instead, I am using the Greek yogurt to give the creamy chili sauce a cool and creamy texture, while the sambal gives heat and the flavors of the chilies. If you like spice, bump up the amount of sambal in your sauce! If you can’t get sambal oelek, other kinds of chili sauce will also work, but you will need to test a little to find the right amount to use. 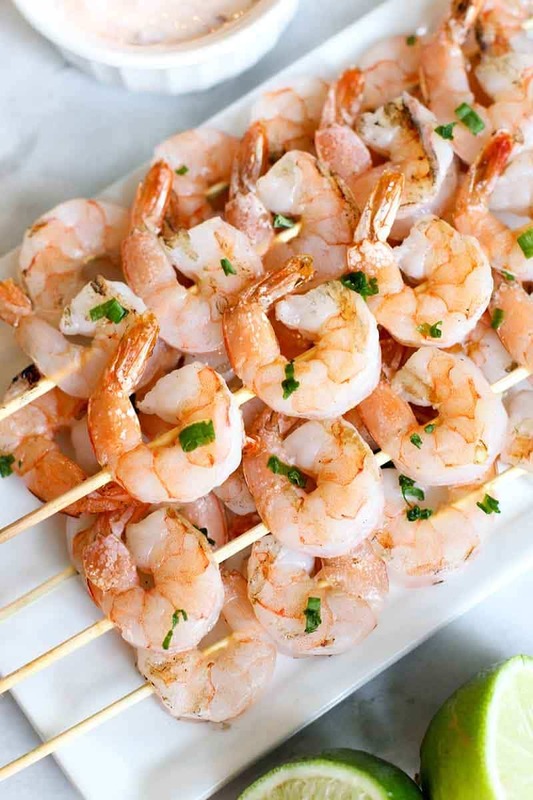 Grilling shrimp on a skewer is the ideal way to get the great flavors, but you can also use a grill basket or aluminum foil with some coconut oil to keep it from sticking. Try soaking the skewers to keep them from burning while on the grill! If you don’t have a grill, sautéing the shrimp or using the same foil packet with coconut oil in the oven is a great alternative! Give these Grilled Shrimp Skewers and the Creamy Chili Sauce a try next time the weather is right for grilling (which is every day here in Santa Monica). It’s a super easy way to make a healthy and tasty meal in a hurry. 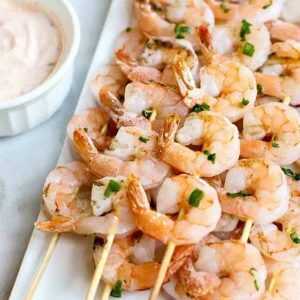 A super easy and delicious way to prepare shrimp on the grill! 1. Skewer the shrimp, about five per skewer. 2. Place shrimp skewers on a grill over medium heat. Grill 2-3 minutes on each side, until the shrimp are pink. Remove and top with lime juice and green onions. For the sauce: Mix greek yogurt, sambal oelek, and lime juice until well combined.